Wednesday, October 24, 2018. 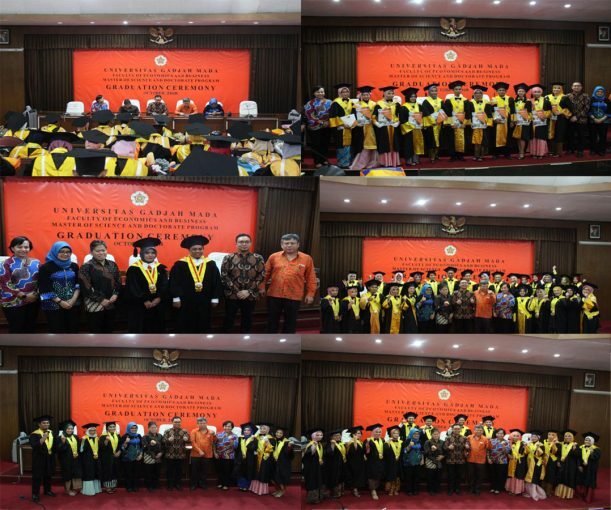 The Master of Science and Doctoral Program, Faculty of Economics and Business, Universitas Gadjah Mada presents a happy moment by officially graduated 52 students. The moment was attended by Dr. Amirullah Setya Hardi as Deputy Dean of Research, Community Service, Cooperation, and Alumni for FEB UGM, Prof. Jogiyanto Hartono as Coordinator of MD FEB UGM Program and Chair of the Accounting Program, Prof. Catur Sugiyanto as chair of Economics Program, Dr. Nurul Indarti as chair of Management Program, and Dr. Rr. Tur Nastiti as manager in Academic, Student, and Cooperation. The event started at 11.30 am, with the submission of the graduation report by Prof. Catur Sugiyanto. In this period, the program has graduated 52 students with details of 26 students from the Accounting Program, 10 students from the Economics Program, 14 students from the Management Program, and 2 students from the Doctoral of Economics Program. Two students from the Doctoral of Economics Program are Duddy Roesmara Donna and Eva Ervani. In the graduation report, it was stated that the highest GPA was achieved by Frida Fanani Rohma from the Accounting Program with GPA of 3.96. Moreover, the highest GPA of Economics Program was achieved by Putri Ayu with GPA of 3.79. Then, the highest GPA of Management Program was achieved by Siti Nuryani Khasanah with GPA of 3.85. The average of GPA in this period is 3.60. Also, the average time of study this period is 28 months with graduation percentage is 23% for men, and 77% for women. The youngest graduated student is Tiffany Dwijaya Hendratama with 23 years old. In the moment, MD FEB UGM program has officially graduated 3250 Master of Science students, with the details 1420 students from Accounting Program, 654 students from Economics Program, and 1176 students from Management Program. Furthermore, the Doctoral Program has officially graduated 257 students with details 94 students from Accounting Program, 66 students from Economics Program, and 97 students from Management Program.